Greens are nutritious and they provide vitamins as well as minerals to your diet. There are a variety of greens available in India. Of these, amaranth, a commonly used green in Tamilian cuisine is best suited for making ‘keerai masiyal’. My grandmother used to make this recipe in two different methods. I have already shared the simple method with you. This recipe is interesting with the addition of coconut and lentils. Try to incorporate greens in your menu at least twice or thrice a week for keeping good health. I hope you find this recipe useful. *Spleen amaranth (அரைக்கீரை) or tender amaranth (தண்டு கீரை) may be used for this recipe. 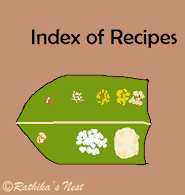 *You may use the required quantity of dhal, from toor dhal that you cook for making sambar or any other recipe. Method: Separate the leaves of spleen amaranth (அரைக்கீரை). Chop off the thick stem portion of tender amaranth (தண்டு கீரை) and use the leafy portion. Whatever the type of greens you choose, roughly chop the leaves . Wash the chopped leaves in water 2-3 times, drain and keep aside. Cover and cook the chopped greens with 50ml of water and asafoetida in a large kadai. Turn the contents once or twice. Once cooked, amaranth reduces to ⅓ of its original quantity. Switch off the fire and allow it to cool. Drain the excess water. Add required salt to the cooked amaranth and mash it with a hand blender or a ladle into a soft mass. Traditionally, a wooden hand blender (கீரை மத்து) is used for mashing greens. Alternatively, you may mash the cooked amaranth in a mixer-grinder. Use ‘Whip’ or ‘Pulse’ button just once or twice. If you use ‘Grind’ button, the content will become pasty. Transfer the contents to a bowl. Add cooked toor dhal to the masiyal and mix well. Heat 1 teaspoon of coconut oil in a tadka pan (spice pan/தாளிக்கிற கரண்டி), add red chilies and fry till they turn darker. Add in mustard seeds, when they start to sputter, add urad dhal, and fry till the dhal turns golden brown. Remove from fire. Add the seasonings to the masiyal. Now add the remaining coconut oil to the spice pan and fry coconut gratings till they start to turn light brown. Switch off the stove and add the fried coconut gratings on top of the masiyal. Mix the contents together just before serving. Keerai masiyal goes well with rice and rasam/ kuzhambu.